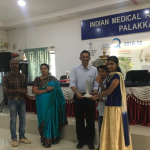 Treasurer – Dr. K. Mukundan, Palghat. 1983: Dr. P.T. Cherian – President and Dr. K. P. Sukumara Pillai – Secretary. Venue: Lions Community Hall, Gandhi Nagar, Ernakulam. During this period the membership rose upto 2039. building fund collection was started during this year. Mr. K.P. Ramachandran Nair of Alappuzha replaced K.G.R. Kartha as the new Health Minister in 1983. The 20% reservation for Post –graduate Diploma was enhanced to 40%. Pathanamthitta District branch was formally inaugurated by state president Dr.P.T.Cheriyan on 9/04/1983, Dr.Gopinathan Nair as President and Dr.M.A.Mohammed as Secretary. Secretary – Dr. K.P. Sukumara Pillai. 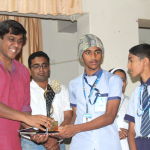 General Secretary – Dr. N.K. Thomas Vaidyan. This year witnessed the real solidarity of the members of K.G.M.O.A. Membership rose to 2254 – an all time high record. In implementing the 24×7 service, a doctor in the CHC-Vizhinjam was suspended for not attending a premature delivery. The Government was trying to victimize the service doctor for the negligence of a CRS doctor. But she was reinstated in the same station by the timely interference by the KGMOA. This year, our association has passed through a hectic period, ie a turbulent period. We had to adopt agitation against government to achieve our demands. There were a lot of discussions with the health minister and even with the chief Minister. A non medical person posted as state mental Health Cordinator was removed from the post upon KGMOA dharna at DHS office.Our State President and Secretary were regularly visiting secretariat to meet the higher officials to get various Government Orders and even the minutes of the discussion we had with the Government. Government wanted to start ops in the medical college of Pathanamthitta and even in the Trivandrum General hospital against our strong protests. We could succeed in Pathanamthitta General hospital & Thiruvananthapuram General Hospital which irritated the health Minister and health secretary. All the discussions with health minister and even with the chief minister failed to resolve the issues. The various memorandums submitted to them were misplaced in the secretariat. Our State president made several visits to the secretariat to trace the minutes but failed miserably. Finally Chief Minister intervened and obtained the minutes. Our PG issue proposal and file also was misplaced in Secretary’s office. This year, Association organized a vahana prajarana jadha named as “POTHUJANAROGYA SAMRAKSHANA JADHA involving all the 14th District branches to create awareness among the public and media against the Government’s policies that badly affect the public health like setting up of new medical colleges by changing boards of GH and DH of Health services and also upgradation of various hospitals by simply changing the names ,exposing the deficiencies in the Health services department & also raising various other demands. KGMOA got a good appreciation for our venture from the public and various media. We organised Secretariat Dharna and Fasting Strike by State office bearers which was unique. Finally Gov created 134 new posts of doctors in the causality Departments. This created a good impression that we are fighting for public health protection also. HR cell in DHS office was reconstituted for our promotion. Controversial night duty order was cancelled. OP time of PHC and CHCs were unified as 9am to 2pm.Two year block of PG deputation benefits were also re instated.Thus, the year 2015 was a productive year in the history of KGMOA. A year which witnessed hectic activities ,the ‘Lions share’ of which were related to correction of THE PAY REVISION anomalies. Govt had stopped Higher start in basic pay. No hike was given for casualty Allowance. Special pay decreased and many other anomalies were present. KGMOA protest started by doing more work on a day .On the MAY DAY our members conducted the Medical Camps declaring it as SOLIDARITY DAY. On 6th September, organized a Secretariat Dharna which was historic with a participation of more than 1350 members from all 14 districts. On the First ONAM , KGMOA conducted the Mass-Fast Dharna in front of the Secretariat. Government called KGMOA for discussion & the strike was withdrawn after settling the issues with a written minutes on the condition that Government Order will come within a month. But the GO when released, even though reinstated the higher start, it was not in consistent with the strike settlement minutes. KGMOA again declared a strike. At last Government had to yield to our demands. During the month of January 2017 authorities invited for high level discussion with Government including Finance Department. They finally agreed to compensate for loss of difference in higher start Pay by giving Personal Pay after a series of marathon deliberations. Special Pay to specialist & administrative Cadre doctors was increased. CMO Allowance, Rural & Difficult Rural Allowance, PM Allowance were enhanced. New Allowance declared for Super Specialist doctors. Ultimately they had to yield to our demands and it was a Golden Feather in the Cap of KGMOA. State Committee under the leadership Dr.Madhu.V & Dr.Raoof.A.K had shown good planning, constant hard work to achieve the goal. Even while agitations of Pay revision were ongoing, our leaders attended to many other issues like “Atrocities “ in Kottarakkara and Arookutyy along with IMA. A Gynaecologist was attacked by relatives of a pregnant lady who died following Amniotic Fluid embolism.Kgmoa went on strike at Kottarakkara. After a month we could arrest the culprits when we moved to court. A doctor was attacked & locked in his house by a mob in connection with death of a patient at Arukutty..But KGMOA by alerting the Government ,he was removed from the scene.KGMOA Alappuzha declared Strike in the midnight itself.With the warning of state wide Strike by State Leaders all culprits were arrested Under HPA. Amidst many protests & agitations, KGMOA also involved in many other Association Activities. 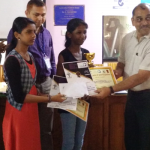 Three Zonal Workshops were conducted to study problems in the different Cadres & to evolve a solution. KGMOA after discussion in each District, formed proposal for Health Policy & submitted to the Dr.Ikbal Committee appointed by the Government. 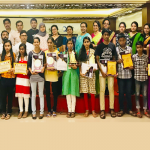 Association awards were arranged to Media person(Dr.Satyanarayanan Memorial Award) & a voluntary social worker(Dr.Satheesh memorial Award) for their contribution to health sector. 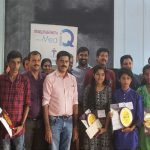 Many branch activities were appreciated especially Amruthakiranam programme – an initiative to give awareness for immunisation launched by Ernakulam Branch and a State level Badminton tournament conducted by Kottayam District. Association day held was at Kozhikode Raviz Kadavu & Golden Jubilee Celebration held at Bolgatty palace,Kochi were memorable. Trivandrum District leading in membership with 530 members. Malappuram comes second with membership 450. This year, KGMOA demanded increasing the member of doctors by revising staff pattern of 1962. Also this year KGMOA took very active interest in the pay revision issue and Medical College issue. KGMOA extended co-operation to the Government proposals of ARDRAM and comprehensive health care and E-health. A committee was elected to consider the issues relating to clinical establishment Bill and similarly Health Policy formulation Bill. Association informed Government about our deep concern over the Parassala Hospital incident. Combined State Committee was held in Trissur and Association Day was celebrated at Moonar in Idukki. 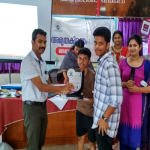 For the First time, Sports and Cultural wing was established in our Association, Sports and Games competition were conducted in Kottayam district. Renovation of KGMOA Building was undertaken in this year. 6 TV Sets were installed in 6 rooms and a new one is kept in the conference hall (49 inch TV) New Public address system was placed in the conference hall and also a centralized AC and 8CC TV cameras were installed in the building. The most important achievement is the extension of retirement Age of our members. Here the efforts of our State President and Secretary is to be specially mentioned. Another important achievement is the Non Availability Certificate issue. (NAC) issue. We also succeeded in bringing back the working hrs to 5 hrs/day from the 36 hrs/week change brought in by the Government.